Why Wait? The Science behind Procrastination. People cost themselves hundreds of dollars by rushing to prepare taxes near the April 15 deadline. Now, psychological science is beginning to understand the complexities of procrastination. Believe it or not, the Internet did not give rise to procrastination. People have struggled with habitual hesitation going back to ancient civilizations. The Greek poet Hesiod, writing around 800 B.C., cautioned not to “put your work off till tomorrow and the day after.” The Roman consul Cicero called procrastination “hateful” in the conduct of affairs. (He was looking at you, Marcus Antonius.) And those are just examples from recorded history. For all we know, the dinosaurs saw the meteorite coming and went back to their game of Angry Pterodactyls. What’s become quite clear since the days of Cicero is that procrastination isn’t just hateful, it’s downright harmful. In research settings, people who procrastinate have higher levels of stress and lower well-being. In the real world, undesired delay is often associated with inadequate retirement savings and missed medical visits. Considering the season, it would be remiss not to mention past surveys by H&R Block, which found that people cost themselves hundreds of dollars by rushing to prepare income taxes near the April 15 deadline. In the past 20 years, the peculiar behavior of procrastination has received a burst of empirical interest. With apologies to Hesiod, psychological researchers now recognize that there’s far more to it than simply putting something off until tomorrow. True procrastination is a complicated failure of self-regulation: experts define it as the voluntary delay of some important task that we intend to do, despite knowing that we’ll suffer as a result. A poor concept of time may exacerbate the problem, but an inability to manage emotions seems to be its very foundation. “What I’ve found is that while everybody may procrastinate, not everyone is a procrastinator,” says APS Fellow Joseph Ferrari, a professor of psychology at DePaul University. He is a pioneer of modern research on the subject, and his work has found that as many as 20 percent of people may be chronic procrastinators. A major misperception about procrastination is that it’s an innocuous habit at worst, and maybe even a helpful one at best. 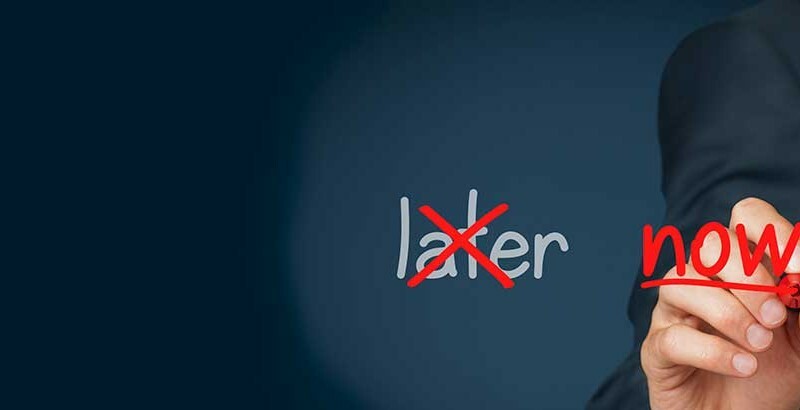 Sympathizers of procrastination often say it doesn’t matter when a task gets done, so long as it’s eventually finished. Some even believe they work best under pressure. Stanford philosopher John Perry, author of the book The Art of Procrastination, has argued that people can dawdle to their advantage by restructuring their to-do lists so that they’re always accomplishing something of value. Psychological scientists have a serious problem with this view. They argue that it conflates beneficial, proactive behaviors like pondering (which attempts to solve a problem) or prioritizing (which organizes a series of problems) with the detrimental, self-defeating habit of genuine procrastination. If progress on a task can take many forms, procrastination is the absence of progress. One of the first studies to document the pernicious nature of procrastination was published in Psychological Science back in 1997. APS Fellow Dianne Tice and APS William James Fellow Roy Baumeister, then at Case Western Reserve University, rated college students on an established scale of procrastination, then tracked their academic performance, stress, and general health throughout the semester. Initially there seemed to be a benefit to procrastination, as these students had lower levels of stress compared to others, presumably as a result of putting off their work to pursue more pleasurable activities. In the end, however, the costs of procrastination far outweighed the temporary benefits. Procrastinators earned lower grades than other students and reported higher cumulative amounts of stress and illness. True procrastinators didn’t just finish their work later — the quality of it suffered, as did their own well-being. A little later, Tice and Ferrari teamed up to do a study that put the ill effects of procrastination into context. They brought students into a lab and told them at the end of the session they’d be engaging in a math puzzle. Some were told the task was a meaningful test of their cognitive abilities, while others were told that it was designed to be meaningless and fun. Before doing the puzzle, the students had an interim period during which they could prepare for the task or mess around with games like Tetris. As it happened, chronic procrastinators only delayed practice on the puzzle when it was described as a cognitive evaluation. When it was described as fun, they behaved no differently from non-procrastinators. In an issue of the Journal of Research in Personality from 2000, Tice and Ferrari concluded that procrastination is really a self-defeating behavior — with procrastinators trying to undermine their own best efforts. There’s no single type of procrastinator, but several general impressions have emerged over years of research. Chronic procrastinators have perpetual problems finishing tasks, while situational ones delay based on the task itself. A perfect storm of procrastination occurs when an unpleasant task meets a person who’s high in impulsivity and low in self-discipline. (The behavior is strongly linked with the Big Five personality trait of conscientiousness.) Most delayers betray a tendency for self-defeat, but they can arrive at this point from either a negative state (fear of failure, for instance, or perfectionism) or a positive one (the joy of temptation). All told, these qualities have led researchers to call procrastination the “quintessential” breakdown of self-control. Social scientists debate whether the existence of this gap can be better explained by the inability to manage time or the inability to regulate moods and emotions. Generally speaking, economists tend to favor the former theory. Many espouse a formula for procrastination put forth in a paper published by the business scholar Piers Steel, a professor at the University of Calgary, in a 2007 issue of Psychological Bulletin. The idea is that procrastinators calculate the fluctuating utility of certain activities: pleasurable ones have more value early on, and tough tasks become more important as a deadline approaches. Psychologists like Ferrari and Pychyl, on the other hand, see flaws in such a strictly temporal view of procrastination. For one thing, if delay were really as rational as this utility equation suggests, there would be no need to call the behavior procrastination — on the contrary, time-management would fit better. Beyond that, studies have found that procrastinators carry accompanying feelings of guilt, shame, or anxiety with their decision to delay. This emotional element suggests there’s much more to the story than time-management alone. Pychyl noticed the role of mood and emotions on procrastination with his very first work on the subject, back in the mid-1990s, and solidified that concept with a study published in the Journal of Social Behavior and Personality in 2000. His research team gave 45 students a pager and tracked them for five days leading up to a school deadline. Eight times a day, when beeped, the test participants reported their level of procrastination as well as their emotional state. As the preparatory tasks became more difficult and stressful, the students put them off for more pleasant activities. When they did so, however, they reported high levels of guilt — a sign that beneath the veneer of relief there was a lingering dread about the work set aside. The result made Pychyl realize that procrastinators recognize the temporal harm in what they’re doing, but can’t overcome the emotional urge toward a diversion. A subsequent study, led by Tice, reinforced the dominant role played by mood in procrastination. In a 2001 issue of the Journal of Personality and Social Psychology, Tice and colleagues reported that students didn’t procrastinate before an intelligence test when primed to believe their mood was fixed. In contrast, when they thought their mood could change (and particularly when they were in a bad mood), they delayed practice until about the final minute. The findings suggested that self-control only succumbs to temptation when present emotions can be improved as a result. In general, people learn from their mistakes and reassess their approach to certain problems. For chronic procrastinators, that feedback loop seems continually out of service. The damage suffered as a result of delay doesn’t teach them to start earlier the next time around. An explanation for this behavioral paradox seems to lie in the emotional component of procrastination. Ironically, the very quest to relieve stress in the moment might prevent procrastinators from figuring out how to relieve it in the long run. A few years ago, Sirois recruited about 80 students and assessed them for procrastination. The participants then read descriptions of stressful events, with some of the anxiety caused by unnecessary delay. In one scenario, a person returned from a sunny vacation to notice a suspicious mole, but put off going to the doctor for a long time, creating a worrisome situation. Afterward, Sirois asked the test participants what they thought about the scenario. She found that procrastinators tended to say things like, “At least I went to the doctor before it really got worse.” This response, known as a downward counterfactual, reflects a desire to improve mood in the short term. At the same time, the procrastinators rarely made statements like, “If only I had gone to the doctor sooner.” That type of response, known as an upward counterfactual, embraces the tension of the moment in an attempt to learn something for the future. Simply put, procrastinators focused on how to make themselves feel better at the expense of drawing insight from what made them feel bad. Recently, Sirois and Pychyl tried to unify the emotional side of procrastination with the temporal side that isn’t so satisfying on its own. In the February issue of Social and Personality Psychology Compass, they propose a two-part theory on procrastination that braids short-term, mood-related improvements with long-term, time-related damage. The idea is that procrastinators comfort themselves in the present with the false belief that they’ll be more emotionally equipped to handle a task in the future. Recently the behavioral research into procrastination has ventured beyond cognition, emotion, and personality, into the realm of neuropsychology. The frontal systems of the brain are known to be involved in a number of processes that overlap with self-regulation. These behaviors — problem-solving, planning, self-control, and the like — fall under the domain of executive functioning. Oddly enough, no one had ever examined a connection between this part of the brain and procrastination, says Laura Rabin of Brooklyn College. “Given the role of executive functioning in the initiation and completion of complex behaviors, it was surprising to me that previous research had not systematically examined the relationship between aspects of executive functioning and academic procrastination — a behavior I see regularly in students but have yet to fully understand, and by extension help remediate,” says Rabin. To address this gap in the literature, Rabin and colleagues gathered a sample of 212 students and assessed them first for procrastination, then on the nine clinical subscales of executive functioning: impulsivity, self-monitoring, planning and organization, activity shifting, task initiation, task monitoring, emotional control, working memory, and general orderliness. The researchers expected to find a link between procrastination and a few of the subscales (namely, the first four in the list above). As it happened, procrastinators showed significant associations with all nine, Rabin’s team reported in a 2011 issue of the Journal of Clinical and Experimental Neuropsychology. Rabin stresses the limitations of the work. For one thing, the findings were correlative, meaning it’s not quite clear those elements of executive functioning caused procrastination directly. The assessments also relied on self-reports; in the future, functional imaging might be used to confirm or expand the brain’s delay centers in real time. Still, says Rabin, the study suggests that procrastination might be an “expression of subtle executive dysfunction” in people who are otherwise neuropsychologically healthy. “This has direct implications for how we understand the behavior and possibly intervene,” she says. As the basic understanding of procrastination advances, many researchers hope to see a payoff in better interventions. Rabin’s work on executive functioning suggests a number of remedies for unwanted delay. Procrastinators might chop up tasks into smaller pieces so they can work through a more manageable series of assignments. Counseling might help them recognize that they’re compromising long-term aims for quick bursts of pleasure. The idea of setting personal deadlines harmonizes with previous work done by behavioral researchers Dan Ariely and Klaus Wertenbroch on “precommitment.” In a 2002 issue of Psychological Science, Ariely and Wertenbroch reported that procrastinators were willing to set meaningful deadlines for themselves, and that the deadlines did in fact improve their ability to complete a task. These self-imposed deadlines aren’t as effective as external ones, but they’re better than nothing. Ferrari, who offers a number of interventions in his 2010 book Still Procrastinating? The No Regrets Guide to Getting It Done, would like to see a general cultural shift from punishing lateness to rewarding the early bird. He’s proposed, among other things, that the federal government incentivize early tax filing by giving people a small break if they file by, say, February or March 15. He also suggests we stop enabling procrastination in our personal relationships. But while the tough love approach might work for couples, the best personal remedy for procrastination might actually be self-forgiveness. A couple years ago, Pychyl joined two Carleton University colleagues and surveyed 119 students on procrastination before their midterm exams. The research team, led by Michael Wohl, reported in a 2010 issue of Personality and Individual Differences that students who forgave themselves after procrastinating on the first exam were less likely to delay studying for the second one. Pychyl says he likes to close talks and chapters with that hopeful prospect of forgiveness. He sees the study as a reminder that procrastination is really a self-inflicted wound that gradually chips away at the most valuable resource in the world: time. Ariely, D., & Wertenbroch, K. (2002). Procrastination, deadlines, and performance: Self-control by precommitment. Psychological Science, 13, 219–224. Ferrari, J. R. (2010). Still Procrastinating? The No Regrets Guide to Getting It Done. (Hoboken, N.J.: Wiley). Perry, J. (2012). The Art of Procrastination: A Guide to Effective Dawdling, Lollygagging and Postponing. (New York, Workman). Pychyl, T. A., Lee, J. M., Thibodeau, R., & Blunt, A. (2000). Five days of emotion: An experience sampling study of undergraduate student procrastination. Journal of Social Behavior and Personality, 15, 239–254. Rabin, L. A., Fogel, J., & Nutter-Upham, K. E. (2011). Academic procrastination in college students: The role of self-reported executive function. Journal of Clinical and Experimental Neuropsychology, 33, 344–357. Sirois, F. M. (2004). Procrastination and counterfactual thinking: Avoiding what might have been. British Journal of Social Psychology, 43, 269–286. Sirois, F. M. & Pychyl, T. A. (2013). 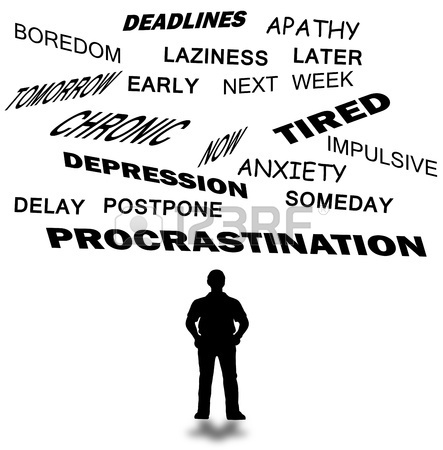 Procrastination and the Priority of Short-Term Mood Regulation: Consequences for Future Self. Social and Personality Psychology Compass, 7, 115–127. Steel, P. (2007). The nature of procrastination: A meta-analytic and theoretical review of quintessential self-regulatory failure. Psychological Bulletin, 133, 65–94. Tice, D. M., & Baumeister, R. F. (1997). Longitudinal study of procrastination, performance, stress, and health: The costs and benefits of dawdling. Psychological Science, 8, 454–458. Tice, D. M., Bratslavsky, E., & Baumeister, R. F. (2001). Emotional distress regulation takes precedence over impulse control: If you feel bad, do it! Journal of Personality and Social Psychology, 80, 53–67. Wohl, M. J. A., Pychyl, T. A., & Bennett, S. H. (2010). I forgive myself, now I can study: How self-forgiveness for procrastinating can reduce future procrastination. Personality and Individual Differences, 48, 803–808. Remind yourself how good it feels to accomplish a task. Bargain with yourself: if you finish the task now, you can go out to dinner later. Announce what you plan to do so you feel more compelled to get it done. Eliminate temptations around you so you can focus on the task at hand. Ask someone to help you. Make a list of things that need to get done. Prioritize the list, placing items that others need to review or handle first so you can hand them off and keep working. Set a deadline and stick to it. Stretch, walk or take a break, to revitalize yourself with the end goal of coming back energized to finish the task.